In the 1800s, states tried to place their county seats near the county center. The county seat usually hosted the county government, the county court, and (conveniently) the county jail. Being equidistant from all villages, it seemed fair. In my own childhood home county of Mercer, Pennsylvania, the town of Mercer became the county seat. I was 16 when I drove our old farm truck to Mercer so that I could take my driver’s exam. I remember my father clutching his passenger door the whole way there, rather sure that he wouldn’t survive my poor driving, though I did come home with license in hand and started commercial beekeeping that summer. It was lucky for my dad that the county seat was centrally located. Had it been in Grove City, our trip would have been ten minutes longer. As you can see in the map, the county seat is near the county center (actually 7 kilometres south, but there is nothing but woods at the actual center). 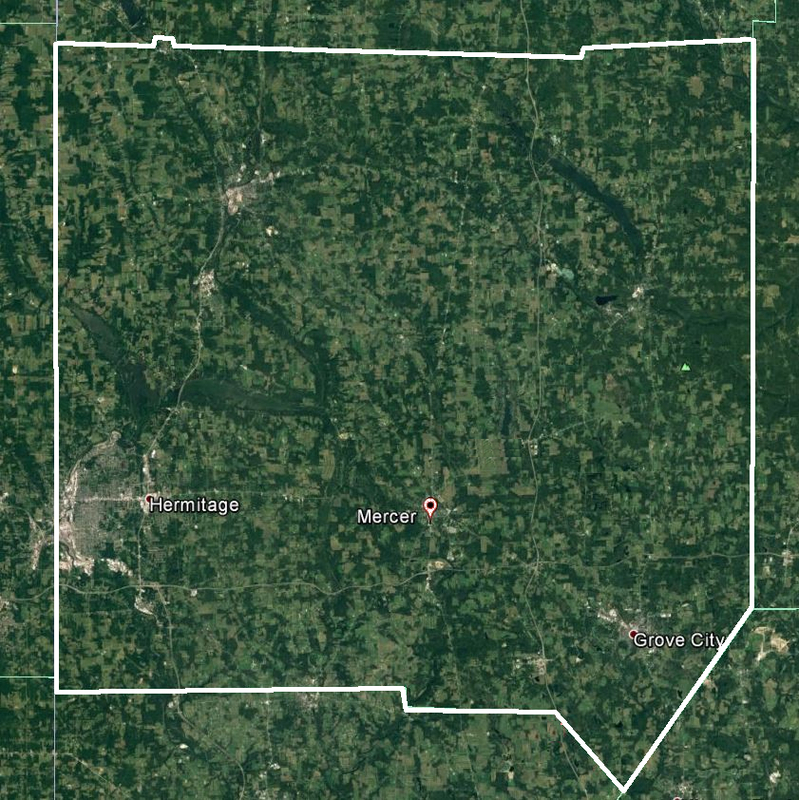 It’s not hard to find the geographic center of a square and Mercer County is very nearly a square. Later, I lived in Saskatchewan, Canada. It’s another jurisdiction which presents little challenge when looking for its center. Saskatchewan’s motto, “Easy to draw; hard to spell”, tells it all. 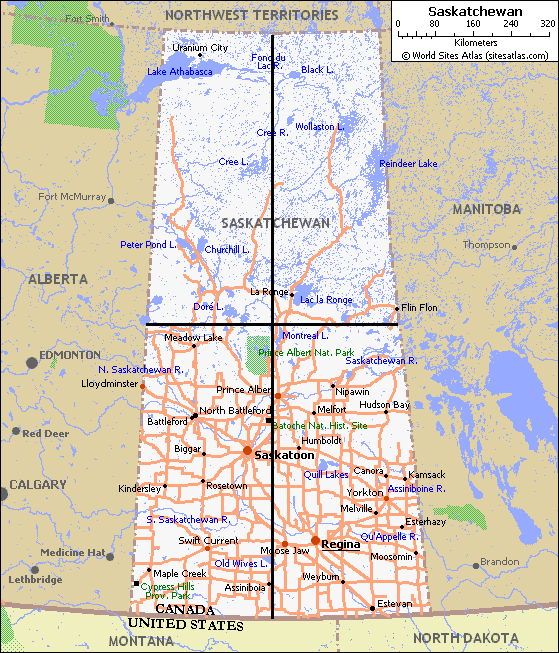 The only surprise with Saskatchewan is that the center is ‘way up north’ – 99% of Saskatchewanians live south of center. The northern half is sparsely populated Canadian Shield while the southern half of Saskatchewan has been flattened out to accommodate millions of acres of wheat fields. And a million European settlers. For years, the geographic center of North America has been described as this stone and mortar monument in Rugby, North Dakota, located 60 kilometres south of Manitoba, Canada. I used to drive past the obelisk a couple times a year back in the days when I owned honey farms in both Florida and Saskatchewan. 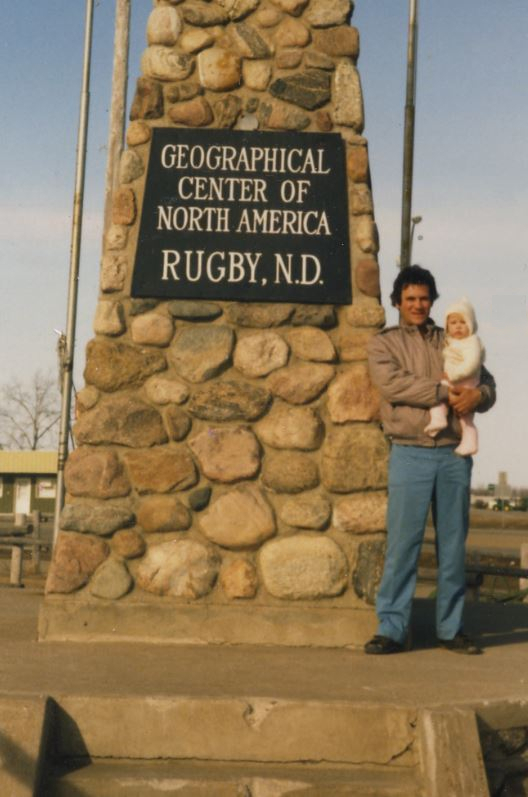 There I am, thirty years ago, daughter in arms, standing at the center of North America. Had the monument been ten kilometres off Highway 2, this photo would have never happened. But there it was and so was I, back in 1985. In 1929, a US Geological Survey geographer cut out a cardboard map of the continent and balanced it on his finger. The balance point – the center of the continent’s mass (if all the mass of the continent were smeared around equally) was taken as the center of North America. He found the spot near the North Dakota towns of Balta and Orrin, 30 kilometres southwest of Rugby. Both towns claimed to be the center, but Rugby sent an application to the US Patent Office to trademark the name, leading suckers like me to believe we’ve been to the center when, in truth, we hadn’t. But the laugh was on Rugby last summer when the trademark expired and a bar owner much further south in North Dakota bought it. So, briefly, Hanson’s Bar (with “On-Off Sales” of liquor) became the continent’s center. But hold on to your cowboy hat, the center is moving again. Geographers with a sense for plate tectonics might choose to use the continental shelf as the outer boundary demarcation, pushing the center east. Others may omit Central America, claiming the extremities of southern Mexico as the bottom of North America. This would slide the center well into Canada, especially if Canada’s claim of the North Pole proves that North America goes that far. Now a State University of New York (at Buffalo) geographer wants to redefine North America’s center. Peter Rogerson has mapped a spot 175 km southwest of Rugby, North Dakota. His center is near the center of Center, North Dakota. The town – population 571 – got its name when it was determined to be the geographic center of Oliver County, North Dakota and thus chosen as the county seat, back in 1902. Center, ND, is only 30 kilometres north of Interstate 94, so Americans travelling from New York City to Seattle may consider the hour detour to stop, look, and have something cold at Wolfie’s Place. Or maybe not, since the trademarked Center of North America(TM) is actually at a bar 115 km east. But an ambitious family would stop at both, I suppose. The Center of Oliver County, ND – the center of North America? (3) then transforming this location back to a latitude and longitude. This all makes sense, of course. One wonders why it took almost 100 years to sum the great circle squares. Regardless the town with the crown, North Dakota is probably the state at the center of North America (though Pierre, South Dakota has tried for the trophy). Being central, North Dakota attracts beekeepers from their wintering apiaries in Texas (2,000 km), California (2,000 km), and Florida (2,500 km). North Dakota is the place with the most summertime bees and it makes the most honey of any US state. Though California and Florida usually get the biggest notice as bee states, North Dakota quietly earns recognition as the top honey producing state – a title held for about 15 consecutive years. Bees arrive from California almond pollination and Florida orange groves by late June, then they forage wild sweet clover, alfalfa, canola, and sunflower until September. During the summer months, almost a quarter of all the hives in the USA are in North Dakota. Then they head south again – very few commercial beekeepers stay the winter. North Dakota, the center of America, has not always been Honey Central. A hundred years ago, honey production was just getting started on the northern plains. The oldest reference I found in American Bee Journal was a reader’s question: “What’s the best time of year to move bees to the Dakotas?” That was asked in January, 1881. (The answer given was April or early May.) So, we may assume honey bees began to be kept there in the 1870s or 1880s. The 1910 US census shows just 279 hives of bees (and an average crop of 27 pounds) while by 1914, there were 495 hives (and an impressive 72 pound/hive average). Ten years later, in 1924, John Lovell (Honey Plants of North America) describes North Dakota as something of a wasteland. “…winters are severe, the acreage of apples, pears, and plums is small, and … alfalfa is not largely cultivated.” However, Lovell notes that in river valleys with wild sweet clover, “an average of 150 to 200 pounds per colony is not uncommon.” Still, it wasn’t until the late 1940s that beekeepers really discovered North Dakota. Me, again, up on the truck bed. Smarter than lifting pallets by hand! One of the first large-scale commercial operators in North Dakota was Earl Emde. I worked with Earl (and bought bees from him) years ago. He told me that when he was based in California, a drought forced him to load a truck with 200 hives and head east. He scouted for days before he found thick tall sweet clover and a rancher willing to give him a bee yard. He unloaded, then rushed back to California for another load of bees. The Emdes had about 5,000 hives by the 1960s, most of them in North Dakota. They were pioneers of commercial trucking of bees (before the war, bees mostly moved by rail). The Emdes invented the pallet quad and were among the first to use forklifts in apiaries. Back in the 1970s, when I was getting started with bees, North Dakota had 50,000 colonies and made 5 million pounds of honey. I remember a huge debate about “overpopulated” nectar forage. Some states enacted laws to restrict bee yards. It was a mistake. Over the next few decades, North Dakota’s colony count and honey production increased ten-fold. Today, it’s 500,000 colonies and 50 million pounds. Recent crop averages have been the same (100 pounds) as they were in 1970. For the past dozen years, North Dakota has persistently led the states in total honey produced. If we include similarly blessed South Dakota, the territories makes one-third of all of America’s domestic crop. About that Center – there are about 200 hives of bees kept in and around Center, North Dakota, though I don’t think there are any beekeepers living in the town – if you know better, let me know. But just 50 kilometres (30 miles) away, Bismark and Mandan are home to a dozen beekeepers, most of whom have two or three thousand hives each. Who knows, maybe Bismark is the continental center? To be updated with the latest in the beekeeping industry to may visit our apiculture latest news. On the other hand if you’re starting beekeeping and would like to begin professional apiculture now download a copy of our beekeeping for beginners ebook. Beekeeping can either be a full-time profession or a simple hobby. Nonetheless, more often than not, what began as a hobby would turn into a profession. But you cannot just tell and determine yourself you will start to do beekeeping. Before starting on any avocation or profession, you need to have satisfactory knowledge and understanding on the subject that you’re going to enter. Then it’s about time to indulge yourself, if you’ve been putting off your curiosity about beekeeping for quite a while. Bee farming may not seem difficult; learning the basic beekeeping lessons can allow you to get off to a good start. On beekeeping to start at the right foot first, you should have complete interest. You need to spend time taking care of your colonies of bees. You should have agreed to share your house space with the bees. There are potential dangers in beekeeping that can damage not only you but your family as well. Then you certainly must understand the supplies and gear you will use for beekeeping if you decide to let the bees inside your living space. Your focus is not only to build an income by selling honey; a great beekeeper should have fire and a keen interest in rearing bees. An apiarist should know the right place for the beehives. If you decide to put your beehives you need to make sure that beekeeping is enabled in your town. There are several places limited to beekeeping; you have to get permission concerning this. Beekeepers must understand whether beekeeping supplies are offered in the region where the beehives are situated. When you have to visit a neighborhood beekeeping shop you may never know; it’s best that a nearby beekeeping store is not inaccessible. Protective gear and equipment can also be very important to beekeepers to know. Beekeepers are prone to bee stings; the ensemble that is ideal must be worn during beekeeping sessions. This will decrease the odds of being stung by your bees. Understand the right type of suit to pick to keep you from any possible risk in beekeeping. Last but definitely not the least, among the beekeeping lessons you must know is that: it is not unimportant for the beekeeper to know the proper way of harvesting honey. If you are unable to harvest honey all the beekeeping efforts would be ineffective. The procedures should be known by a beekeeper in gathering the honey from the comb; beeswax is also part of the yields in beekeeping.